Over nine days at the end of May and into June, the long-anticipated non-invasive survey of the Jewish mass graves in Rohatyn was completed by a team of four scientists from the Centre of Archaeology at Staffordshire University in the UK, led by Dr. Caroline Sturdy Colls, an award-winning archaeologist with extensive research experience at Holocaust sites in Europe and the author of a volume on practical and ethical interdisciplinary approaches to the investigation of Holocaust landscapes. 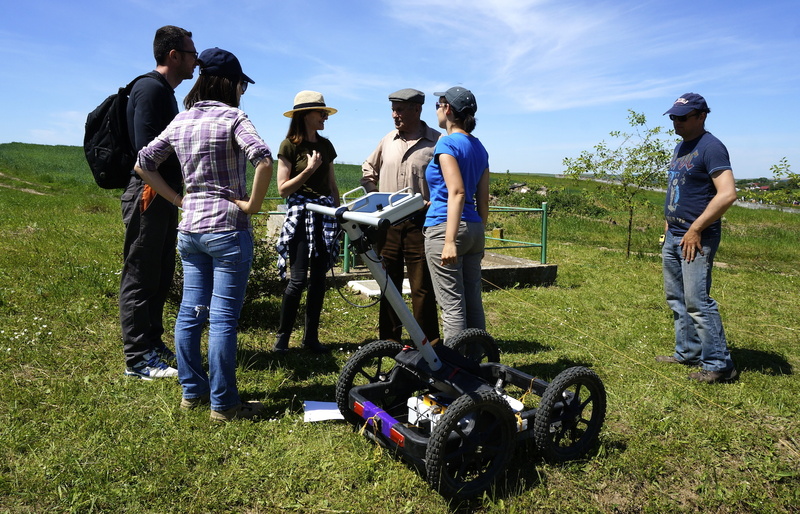 For half of the survey days, the UK team was aided on site by a researcher from The Cyprus Institute, and a second radar. Mapping the north site before radar measurements. Photo © 2017 Jay Osborn. The goal of this work was to try to locate and document the boundaries of the mass graves as a form of public record, to enable the City of Rohatyn to protect these wartime graves as they do other cemeteries in the city, and possibly to enable some form of permanent boundary marker for commemoration by the local population and visitors to Rohatyn. 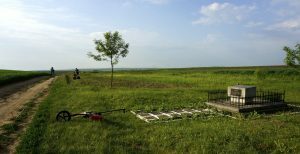 Although this part of the project is large and expensive, it is just one step in our overall plan for the mass grave sites. The elders in the area know things about this place. Photo © 2017 Jay Osborn. As described in the Centre’s project proposal, the site work was preceded by an assessment of historical records and memoirs about the events and the places, many of which were provided to the team by Rohatyn Jewish Heritage. In addition to the geophysical measurements and ground-penetrating radar work at the sites during the past two weeks, the team also examined supplemental evidence on the ground surface at each of the sites, conducted interviews with witnesses to post-war discoveries, managed the re-interment of fragments of human remains found at two of the sites, and conducted an ongoing preliminary review of the radar data to guide each day’s work. Difficult site conditions, technical issues related to the composition of the soil below the surface, and the complexity of the structures above one of the sites, all contributed to make the archaeology work physically demanding for the entire team. Lending a hand with the survey. Photo © 2017 Marla Raucher Osborn. 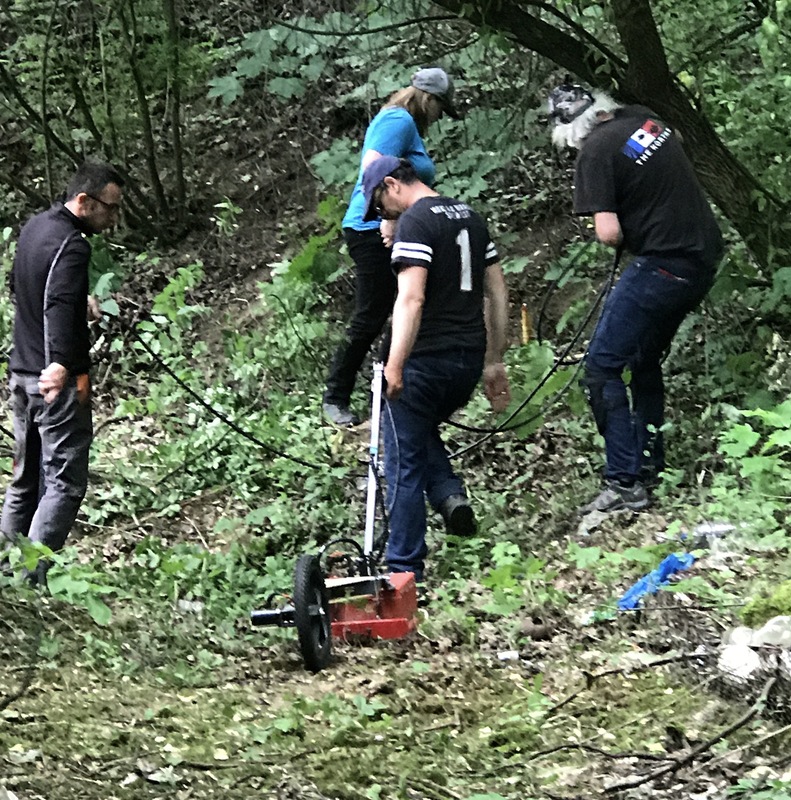 During these site work days, Marla and I continued our ground preparation work, which besides hands-on clearing also included coordinating separate efforts by the Lviv Volunteer Center, the City of Rohatyn, and a private labor contractor (each working at one of the three sites). 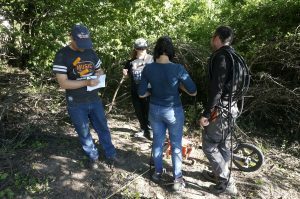 We also supported the archaeologists with logistical issues, provided supplemental transport and a language interpreter, and occasionally added an extra hand in moving the radar equipment around the sites during the surveys. 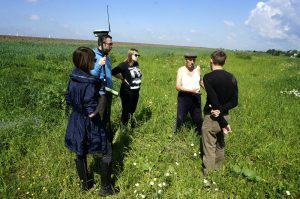 In these support tasks we continued to be strongly aided by our friends in Lviv and in Rohatyn, and for part of the period also by a friend from Israel, as we describe below. Every day included hours of additional manual site prep work, clearing a path for the radar equipment to improve both the quality and the quantity of recorded data. We imagine the team is happy to be back in the office for the rest of the work. Photo © 2017 Marla Raucher Osborn. 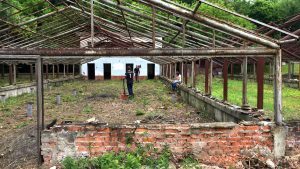 The archaeology team has now returned to the UK and they have posted about the completion of Rohatyn site work on their news page. 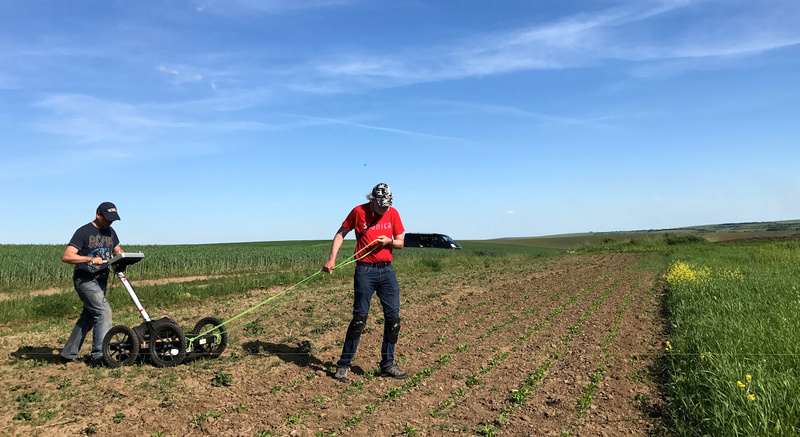 Over the next few months, the archaeology team will analyze the topographic and radar data together with the supplemental and historical information; ultimately they will publish a report with data summaries which we will post publicly on our website. We also intend to arrange for a translation of the report, or the key sections of it, into Ukrainian language for local/regional use. What follows is a summary of the work completed and related findings to date at each of the three sites. Most days included work at all of the sites, overlapping ground preparation, geo measurements, and radar measurements, with a variety of planned and unplanned tasks. Both radar units in service at the south site. Photo © 2017 Jay Osborn. 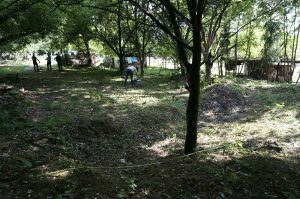 A large portion of this site, associated with the March 1942 killing of Rohatyn’s Jewish community, was cleared by workers organized by the City of Rohatyn a week before the arrival of the archaeological team. 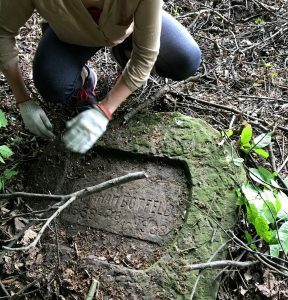 Portions of the site north of the branch road toward the Turkish WWI memorial could not be cleared with available tools and labor, and were left for future research. The site is complicated by its pre-war use as a brick factory and probable clay quarry. 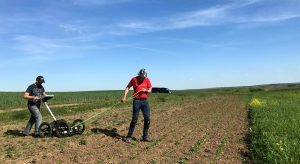 Sections of the extended survey area to the west of the memorial markers, which had been recently planted in wheat and potatoes by local farmers, were not cleared but were nonetheless included in the geophysical and georadar studies (with some difficulty). 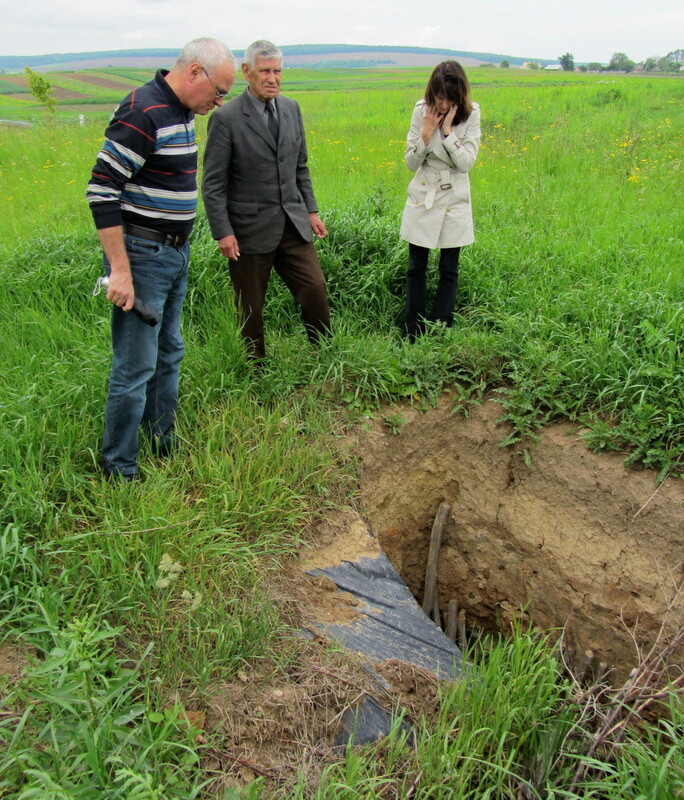 Mr. Vorobets visits the survey work at the south site. Photo © 2017 Jay Osborn. 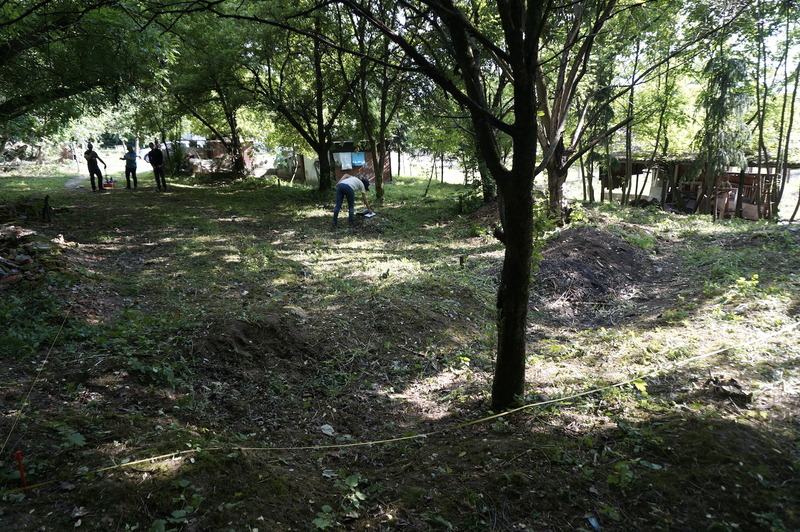 Ultimately the survey area comprised roughly 5000 square meters, or just over half of the original intended study area, and included the 1998 descendants’ monument, the 1980s Soviet monument, and areas identified by elderly locals as likely mass grave locations. The large survey area was scanned completely using the Cyprus radar, then a smaller section was scanned twice with both the UK and Cyprus radars, and on the last day of the survey a large central section was scanned again in a cross pattern with the UK radar based on a preliminary data review by the archaeological team. 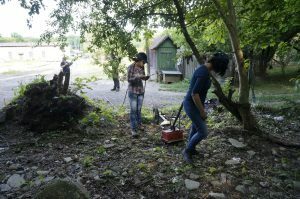 On each day of scanning, the support team did further ground preparation ahead of the radar, including felling residual small trees and stiff shrubs, trimming shrub stumps, leveling molehills, and removing masonry debris and garbage. The looting hole five years ago. Photo © 2012 Jay Osborn. Local legends and child witness memory from the war years has tentatively placed the mass graves at this site south of the 1998 memorial monument. However, recent events and a careful examination of the site by the archaeology team indicate that at least part of the mass grave area is located to the north of the 1998 monument. Almost exactly five years ago, Marla and I were alerted to evidence of a deep scavenging dig north of the monument; at the time we thought the mass grave was south and this dig was intended to plunder other wartime material, unrelated to the Jewish massacre. We knew from later visits that the looting hole was covered and closed after 2012. 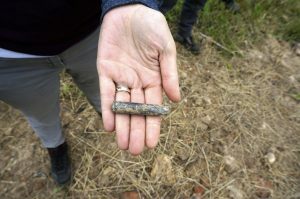 The shell of a rifle bullet is found among the looting debris. Photo © 2017 Jay Osborn. 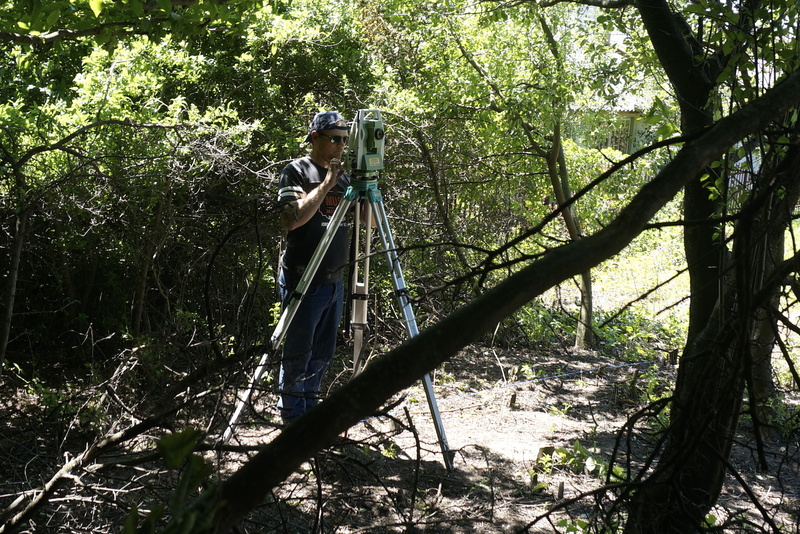 On the first day of research at the site for the current project, while surveying the subsurface area using radar techniques, the archaeology team found and identified fragmented human skeletal remains on the ground surface around the former looting hole; this halted the survey work for a time while everyone present expanded the search. 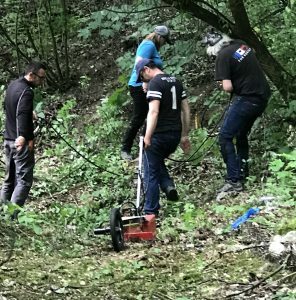 Over the next hours, several more closed looting holes and well over a hundred items on the surface were identified and geo-located, including human bones and fragments, hair, personal items such as pieces of shoes and a belt, and a bullet casing. Some of the disturbed remains had migrated from the holes as far as the main north-south road through the area. Carefully collecting human remains on the ground surface for reburial at the site. Photo © 2017 Jay Osborn. 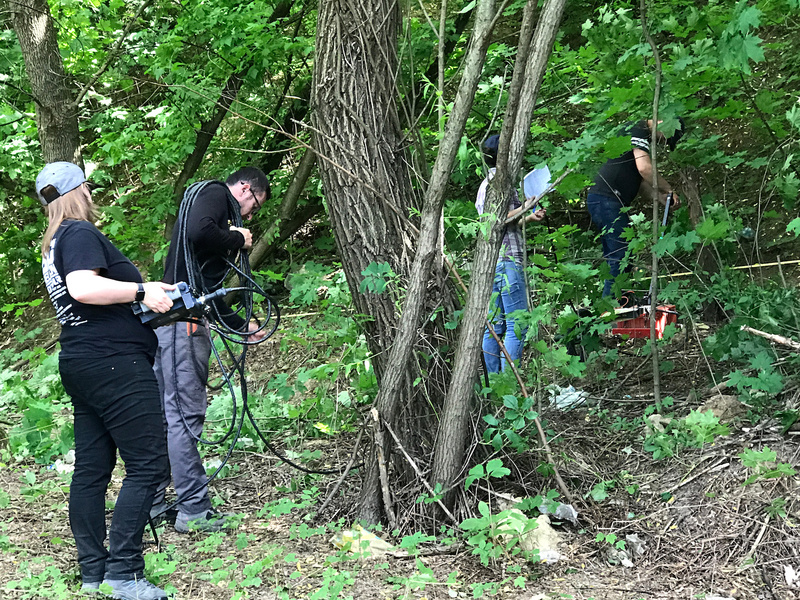 The same day, through our friend and advisor Alex Denysenko we contacted Rabbi Kolesnyk of Ivano-Frankivsk for advice, and he directed us to collect the human remains on the ground surface for immediate burial at the site. From that time through the next day the research and support teams collected loose bones from the ground surface and extracted visible bones from the road, and then buried all the human remains in a depression at the site with a covering of fresh soil from a roadside site well south of the mass grave area. Bones and fragments which were visible at the site but not loose on the surface were left in place and covered with a layer of new soil. The looting effort from five years ago, although criminal, validates the presence of at least one mass grave at this location. 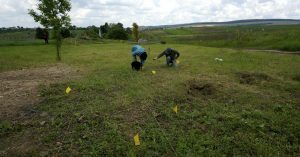 We hope that the difficult survey conditions at the site will still permit analysis of the survey data and identification of part or all of the boundaries of the mass graves located here. The beautiful setting hides the horror underground. Photo © 2017 Jay Osborn. At the east end of the north site, near trenches and buildings. Photo © 2017 Jay Osborn. This site, associated with the June 1943 killing of Jews moved to the Rohatyn ghetto from surrounding towns plus the few surviving Rohatyn Jews remaining there, was a quarry before and during WWII, and continues today as an industrial yard for the city. The original proposed survey area here was very large and complex, including a wide variety of vegetation types from grasses to large trees, both bare and paved flat sections, steep slopes, earthen mounds and pits, open and closed buildings, metal building frames, and considerable debris (building materials and trash). Heading into rougher terrain. Photo © 2017 Jay Osborn. 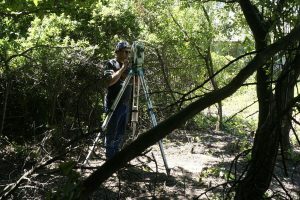 To ensure that measurements could be made in the primary focus areas, the pre-survey clearance area was reduced to focus coverage at the site around locations where remains had been accidentally uncovered within the past few decades. Vegetation at this site was partially cleared by local contract labor ahead of the survey work, paid by Rohatyn Jewish Heritage; surplus building materials and debris were cleared from several sub-areas by support workers and machinery organized through the City of Rohatyn as the survey proceeded. Scanning in the greenhouse bays. Photo © 2017 Ruthy Erez. Existing building structures and other hard boundaries necessitated a division and mapping of the survey space into seven separate sections with some blank boundary areas in between. 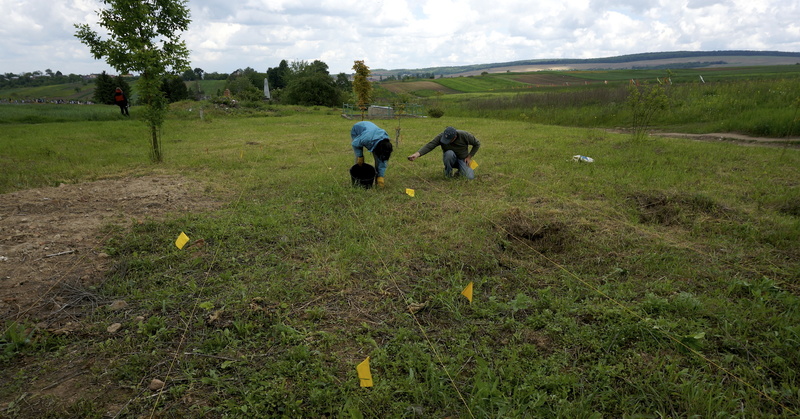 The aggregate survey area was roughly 6000 square meters, or about a quarter of the original intended study area. Local witness reports before and during the site survey indicated two areas in particular where human remains had been unearthed by accident during City work toward the east end of the site, one perhaps 30 years ago and another only about 8 years ago; in both cases the holes were re-covered when the discoveries were made, and work ceased at those parts of the site. Shepherding the radar up the slope. Photo © 2017 Marla Raucher Osborn. The UK radar was used in all sections of the survey at this site; this required continuous cable management by one or two people to negotiate the rough terrain and debris, in addition to those manning the radar and its computer, but the small footprint of the ground-contact radar allowed scanning very close to obstacles and walls, and even partway up the ground slope which borders the site at the east end. As at the south site, we and our support crew worked continuously here to clear paths for the radar, especially removing hard and soft debris plus accumulated garbage; the archaeologists also pitched in to help clear parts of the site. 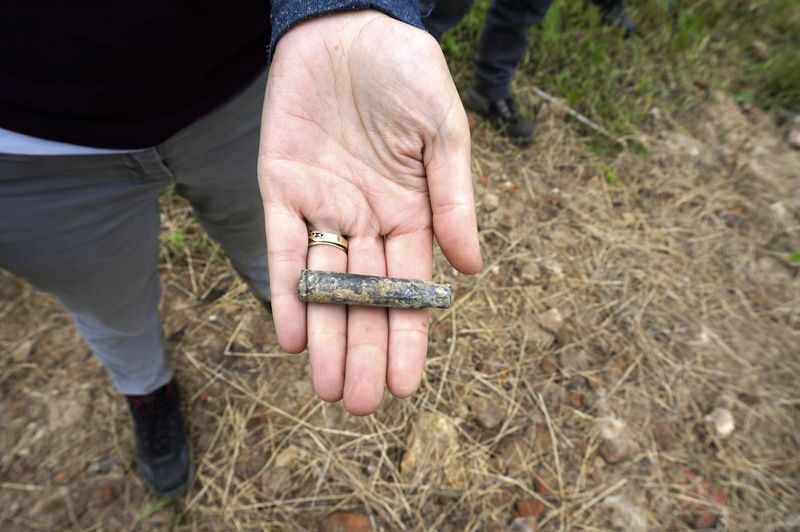 The witness reports of unearthed human remains at the east end of the site were confirmed by the presence of a small number of human bones on the ground surface not far from where the most recent incident had been reported. Here also, the archaeologists buried these bones in a small existing hole at the site. On the flats of the north site. Photo © 2017 Jay Osborn. Topographic measurements precede a second survey at the cemetery. Photo © 2017 Jay Osborn. Rohatyn’s ‘new’ Jewish cemetery is not associated with any recorded aktions during the wartime German occupation, but was likely the burial place of Jews who died of typhus or other causes in the ghetto, and may also have been used for group burials after random killings between the major aktions. 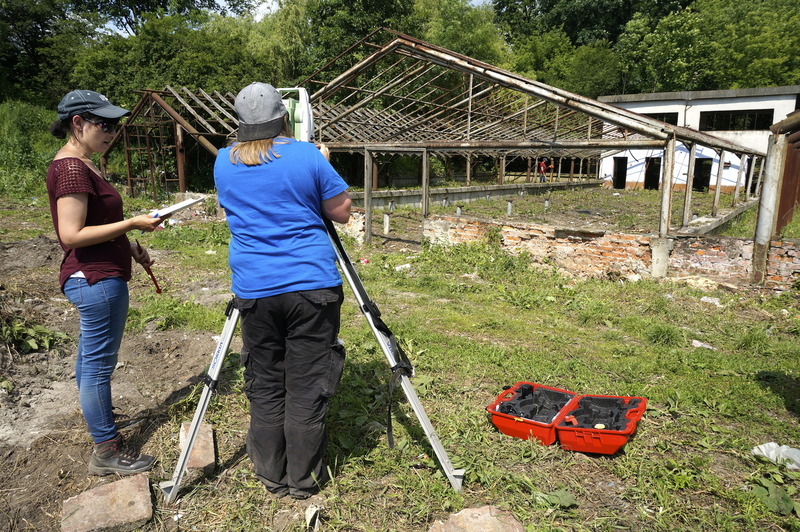 The use of Jewish cemeteries as mass burial places during the war is the focus of a two-year project “Recording Cultural Genocide and Killing Sites in Jewish Cemeteries” funded by the International Holocaust Remembrance Alliance, in which the Staffordshire University archaeology team is a key participant and Rohatyn Jewish Heritage is a collaborative partner. The team compares notes at the end of the survey. Photo © 2017 Jay Osborn. 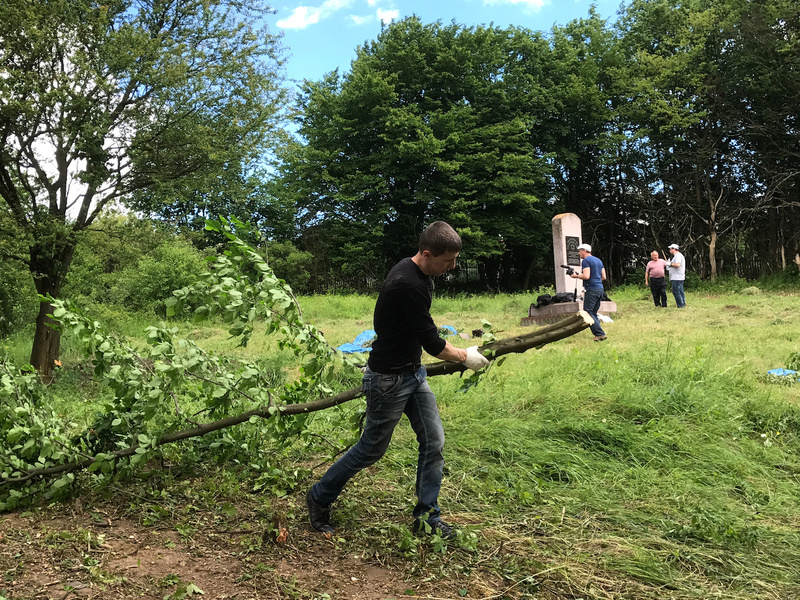 Extensive clearing of the cemetery was accomplished over two long and exhausting days before and during the survey period by volunteers of all ages from the Lviv Volunteer Center, an arm of the Hesed-Arieh Jewish charity organization in Lviv. Marla and I plus local and other visiting volunteers continued to work the site almost every day during the survey period, furthering the removal of plant materials and garbage, leveling molehills, and especially cutting/sawing tree stumps low to the ground to clear scanning paths ahead of the radar units. Green waste was stacked outside the cemetery, awaiting disposal by the City. Inside the cemetery fences, the survey grid was mapped twice by the archaeology team, and scanned once with each of the two radar units, in perpendicular scan paths. Overall the survey grid was just over 2000 square meters, covering about 85% of the irregular fenced cemetery area. The gravestone of Abraham Botfeld is revealed. Photo © 2017 Marla Raucher Osborn. 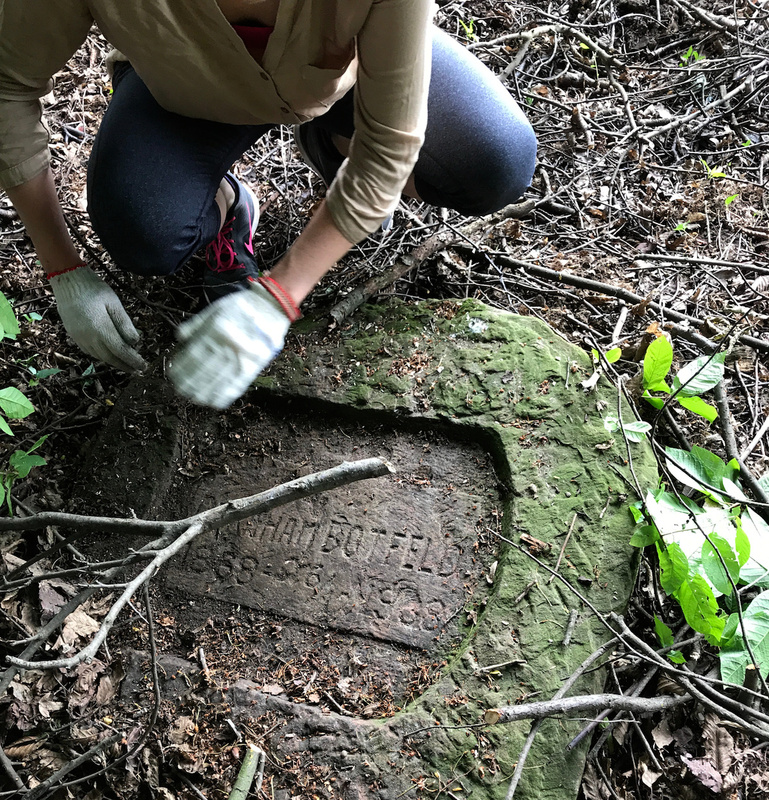 The primary clearing of brush at the site had already revealed a complete headstone which had never before been seen by our group; during the second clearing, a name was found inscribed on the back of the stone. Although detailed analysis of the radar data will be required to detect the presence of mass graves at the site, the archaeologists noted as the radar scanning proceeded that a number of toppled headstones appear to be buried just under the soil surface in the cemetery. The final clearing and scanning work also revealed several additional headstone fragments and base stumps hidden in the grass; the loose stones were collected at the central memorial monument for later transfer. Carefully guided radar work. Photo © 2017 Jay Osborn. Initial review of the data onsite. Photo © 2017 Marla Raucher Osborn. 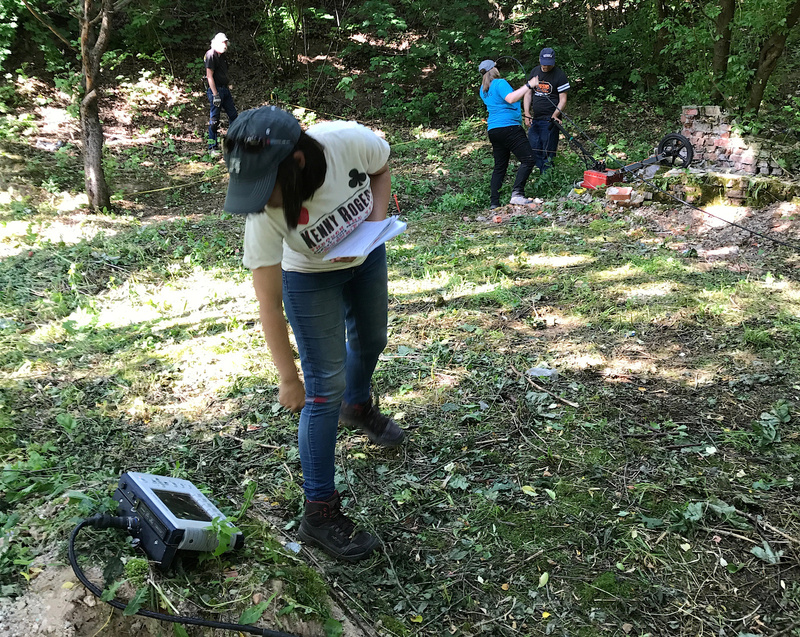 The archaeology team are already working with the data they collected over the nine days of site work; they anticipate about two months of analysis and reporting of the Rohatyn surveys while they conduct other projects this summer. When their report is final, we will post it publicly to this website in English and will arrange for its translation into Ukrainian (also for publication online). 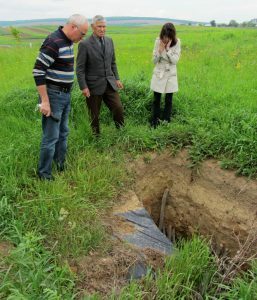 We’ll await those results to decide what further projects to undertake at the mass grave sites in future years, which may include extension of the survey areas, registration of the mass grave boundaries within the Ukrainian cadastral network, permanent boundary markers at the sites, or other projects to be coordinated with the City of Rohatyn. 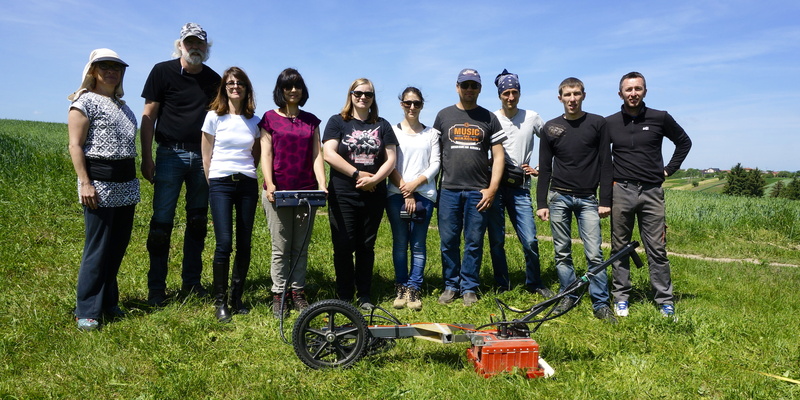 The extended site team poses at the end of the survey behind “Geoffrey”, the UK GPR unit. Photo © 2017 Jay Osborn. On behalf of Rohatyn Jewish Heritage, Marla and I wish to express our sincere gratitude to the hard-working archaeology team who toiled and problem-solved through long days under difficult circumstances, and to all the volunteers from the region and well beyond who joined us to support the scientists in this heavy work. We are proud to name them here. Vasyl doing more than we asked, as always. Photo © 2017 Jay Osborn. With Casey and Ruthy at the sites. Photos © 2017 Jay Osborn. …and many others in Rohatyn in Lviv who aided us in small but important ways all through this work.